This article is contributed by guest writer, @Dakota_Murphey. They say that a home is not complete without a pet. Whether you’re a dog or a cat lover, pets are part of the family and their lifestyle should surely be accommodated in our homes. Take the kitchen, for instance. 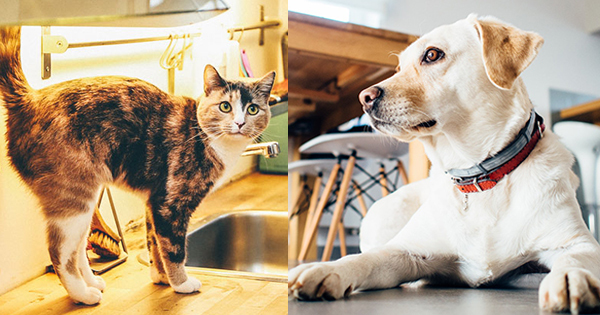 Did you know that you can now get a clever range of fun and funky kitchen solutions that help your furry friends feel right at home but without impacting on that coveted designer kitchen feel? Of course, it’s not just about creature comforts. Some of the things we humans take for granted in the kitchen can be downright dangerous to our beloved pets. A forward-thinking kitchen company should be able to take on board the requirements for all the family, pets included. 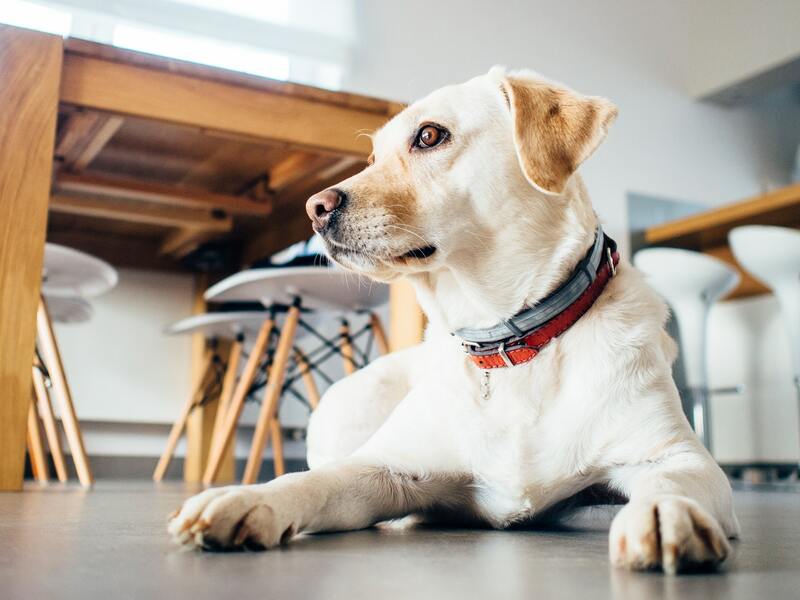 Let’s look at different ways to make your kitchen a pet friendly place to be. Most dogs want to be at the center of their family’s activities, particularly in the heart of the home. 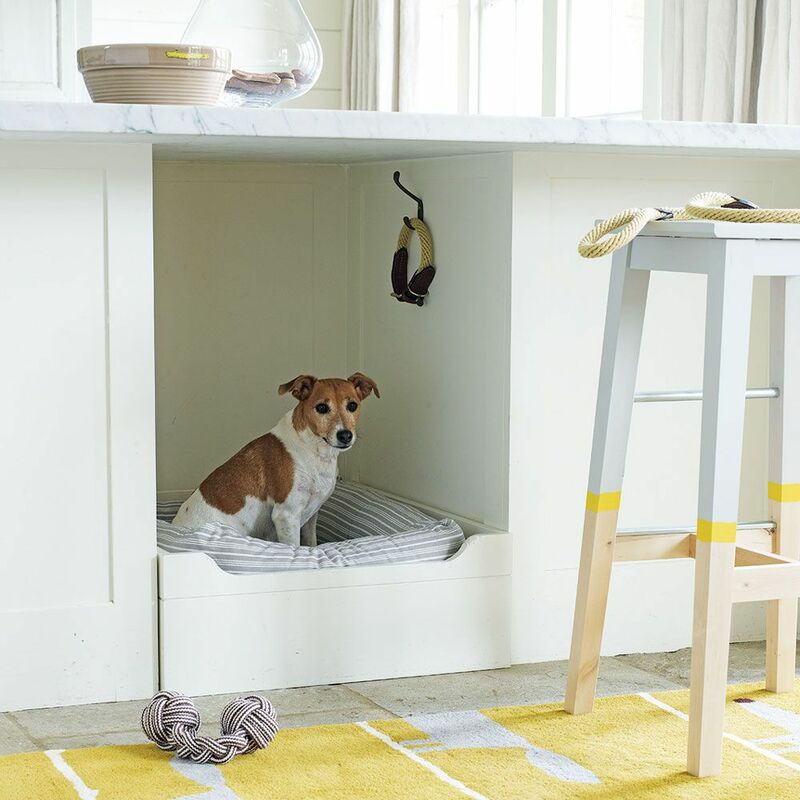 If you’re having a new kitchen fitted, why not incorporate a space for a built-in bed for your dog into the kitchen design, so he can be around you? An integrated dog bed is not only a great space saver but it allows your pup to be right by your side without getting in the way. Dog bowls in the kitchen can be unsightly and a trip hazard while bulk bags or tins of dog food take up valuable storage space in the kitchen that could be used for utensils, food and gadgets for human use. 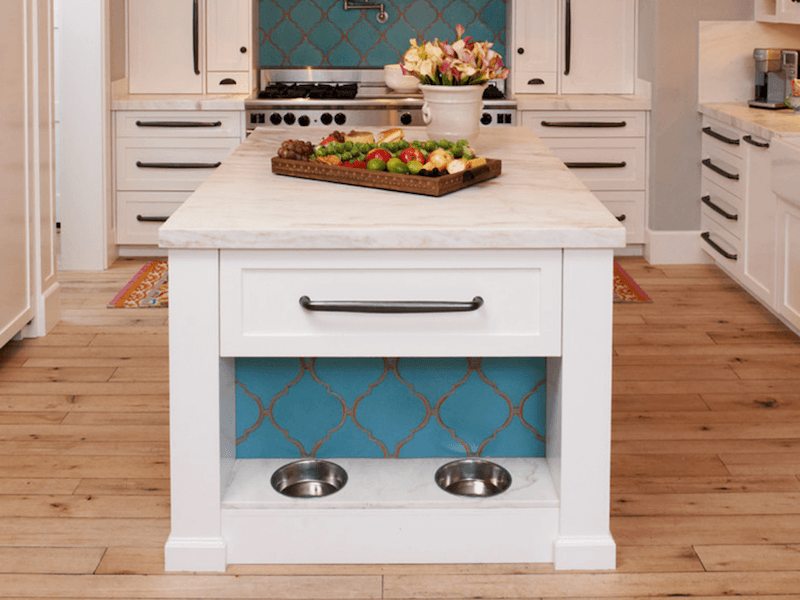 Why not include a handy feeding station to help optimize your kitchen space and have all your dog paraphernalia – food, toys, treats, leashes – in one place? Unlike dogs, cats love nothing better than climbing to a cozy, high-up vantage point and resting there. 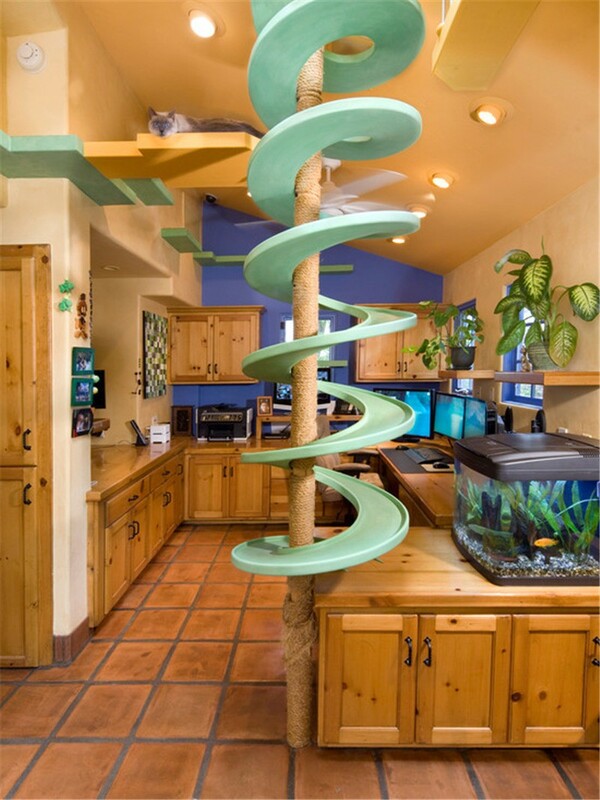 Why not take inspiration from this cool and visually quirky cat playground, custom built for a homeowner with 18 cats? You could perhaps incorporate something less extravagant but offering similar levels of feline fun in your home? Without a doubt, cooking is the core activity for any kitchen, but have you given any thought to the dangers of hot surfaces for your pets? Cats can easily jump up onto a hot hob and sustain burn injuries to their delicate paw pads. Choose an induction hob that only heats the saucepan surface and cools down quickly, or fit a hob cover. 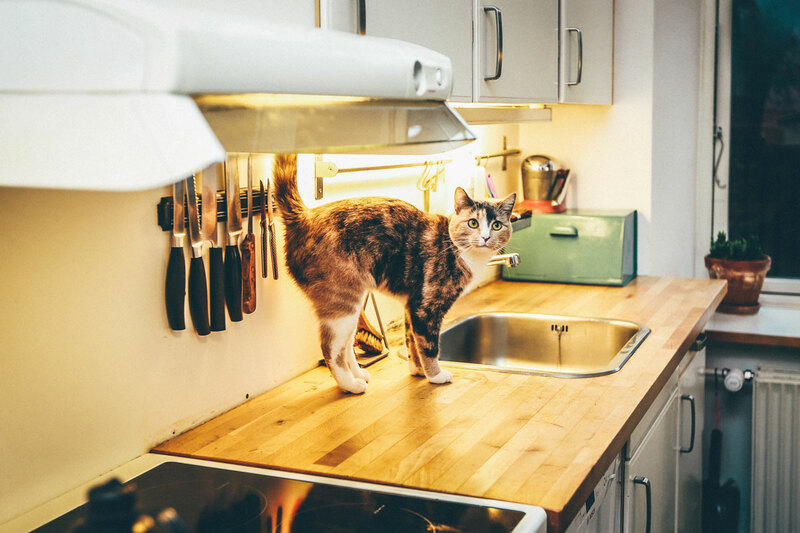 A kitchen is full of sharp objects such as knives and cutlery that can be dangerous to cats and dogs if they fall out of utensil holders or unsafe drawers. Consider fitting child proofing latches to drawers and keep sharp kitchen knives in a knife block and well away from the worktop edge, so they cannot be tipped over by a paw or tail. We all know that pets can be mucky. 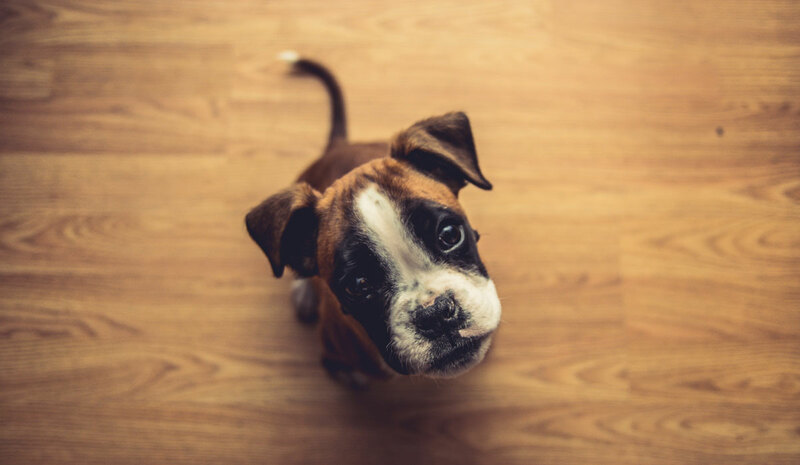 If you know you’re going to share your kitchen with a dog or cat, consider the installation of hygienic and easy-to-clean hard surfaces on your kitchen floor and walls. Attractive ceramic tiles, LVT (luxury vinyl tiles) or laminate flooring are a doddle to clean with a damp mop, while water resistant wall paints simply need a wipeover to keep clean. While meticulous cleaning of a kitchen where pets dwell is non-negotiable, you should also take care to avoid cleaning products that are poisonous when ingested by our furry pals. Most household detergents will have a childproof lid, but a determined puppy may well chew through the plastic. Make sure all cleaning supplies are safely stored away after use.